I’m back. Slowly but surely reassembling my techno-arsenal. It’s not easy, especially when you are one who views yesterday’s technology as an improvement over what is available for purchase today. The iphones have gotten bigger, the sole remaining ipod option will no longer fit into Steve Jobs’ tiny watch pocket, and Windows 10’s darkness is seeping through the cracks of my browser despite my brother Don’s valiant efforts to coat it in a layer of classic Windows 7 whitewash. Technology marches on, aggravating those of us who liked it just the way it was. A lesson learned, no matter how good of a job backing up I have done, it’s never “good enough.” I lost a thousand photos and my most recent updates to my music library. But what really hurt were the copious amounts of notes I had taken in Notepad and saved to the desktop. Notes on things I need to do this year. Notes on places I’d like to visit this year. Notes on taxes, healthcare plans, and my own encrypted list of passwords, most of it impossible to recall without my cheat sheet. Not a day goes by that I don’t go to retrieve something important, only to realize it’s not there. It will take me months to piece it all together again. But then one day in the not too distant future, I trust all that was lost will be forgotten…just like all the junk that didn’t make the cut into my storage shed. I am so far behind on the blog now after spending a wonder-filled month in Ecuador that on one hand, it seems pointless to go back and “serve up stale donuts.” On the other hand, the memories of the incredible sites and experiences from Mexico, Belize, and Ecuador are rapidly fading. I have long said the blog is my way to combine my three favorite hobbies, travel, photography, and writing. It’s never really been about chronicling my day to day maneuvers, ergo so few “real time updates.” It remains the easiest way to capture what I experienced with a combination of words and pictures… my personal opinions and impressions frozen in time. So that’s a long way of saying I am going to be reporting “old news” for a while. If that sort of thing is not of interest, I am not offended if you choose to unsubscribe. I thumbed through Mayabell’s laminated book of day tours offered until I finally recognized the odd dual name. Good thing I hadn’t had time to do much research, as I otherwise might have passed on this one. 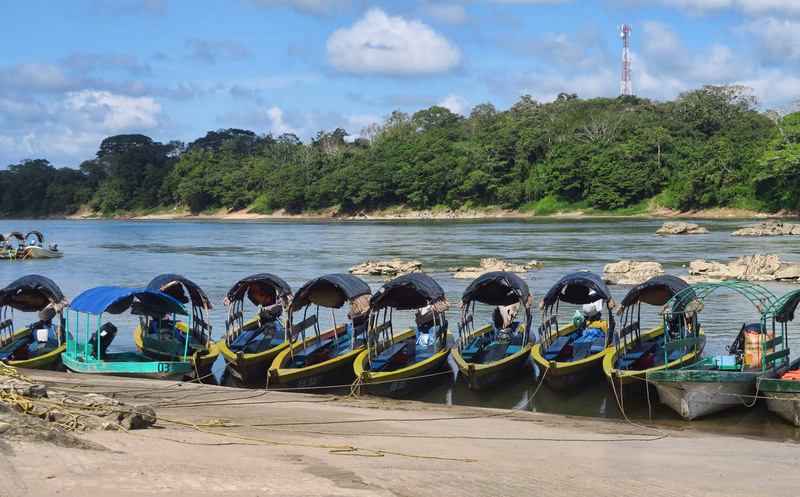 We would leave at 6:00am, and not be back until 8:00pm….three hours down a rough pot-holed road to reach the river, a ninety minute boat ride, and three hours back, a tour so long it included two meals, breakfast and lunch. It would be a long day even though I had scored the shotgun seat in the front of the Sprinter tour bus. Otherwise, I might have been negotiating a taxi halfway through the tour! 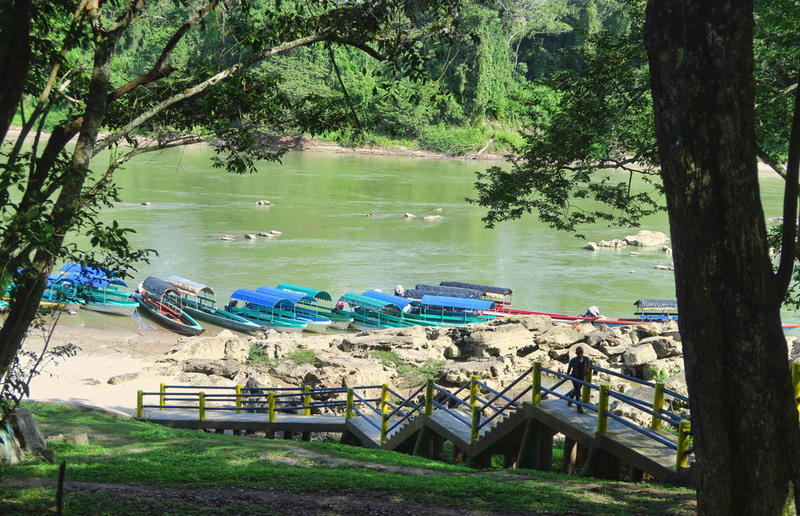 It’s a three hour drive to reach the Usumacinta River, where we will board a boat for the 45 minute ride to Yaxchilán. We load up 6 to a boat. It’s a peaceful ride down the lazy river. Hard to believe that’s Guatemala on the other side. 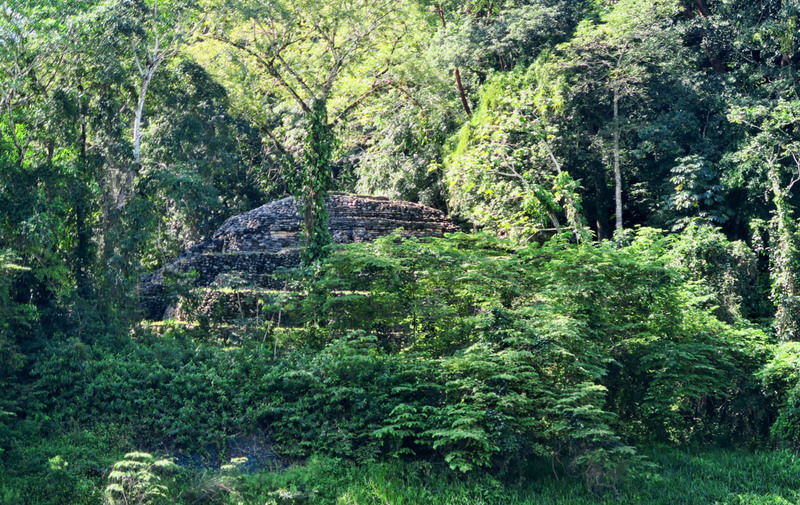 There are ruins hidden in the jungle along the banks of the river. Can you spot the “wildlife?” No swimming in this river! 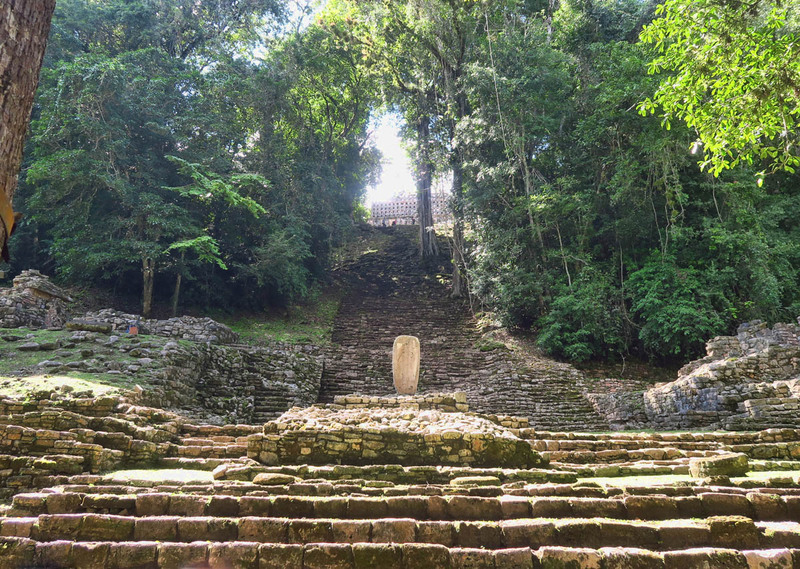 Yaxchilán is an ancient Mayan city on the banks of the the Usumacinta River, which makes up part of Mexico’s southern border with Guatemala. 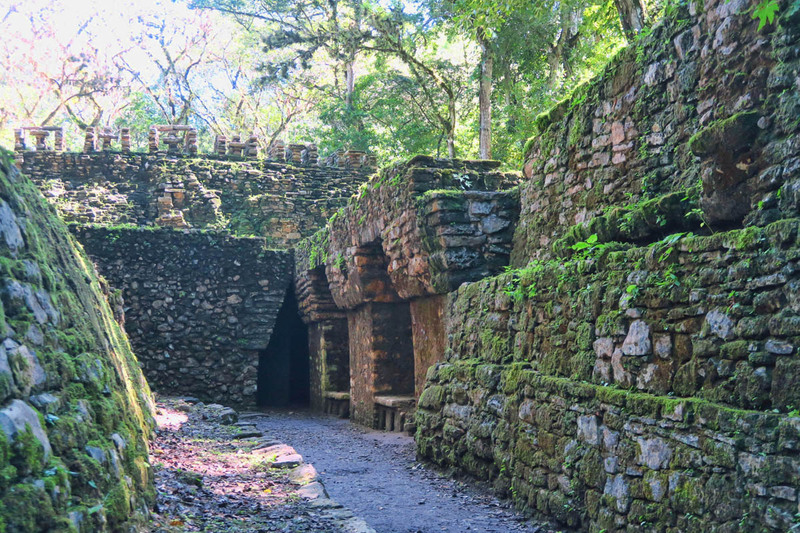 Scientists estimate their civilization began around 250 A.D. and ended around 900 A.D.
As we putt-putt along the river, I marvel at the fact that Guatemala is just on the other side. 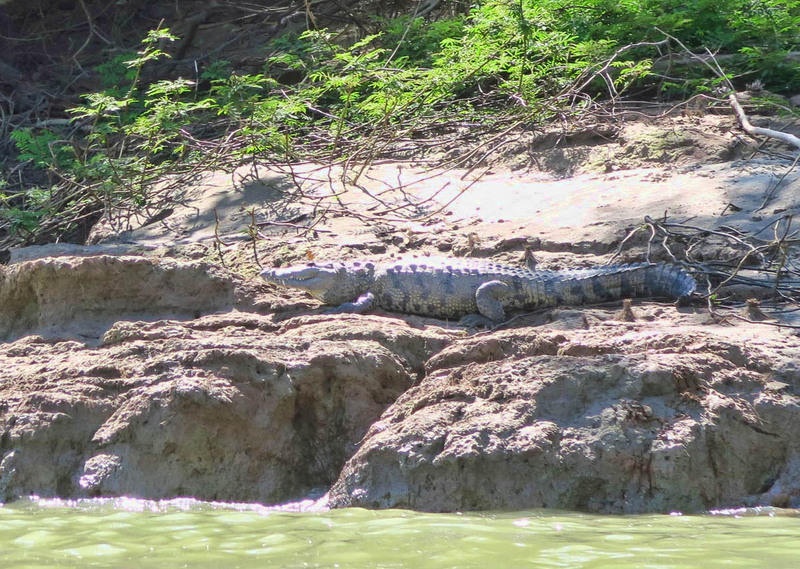 I could easily swim across the border if it weren’t for the alligators. I look at the dark, tangled jungle and wonder how in the world ancient civilization ended up here, deep in the impenetrable forest. Why here? That inverted V-shaped hole to the left of center is the entrance to the archeological site. 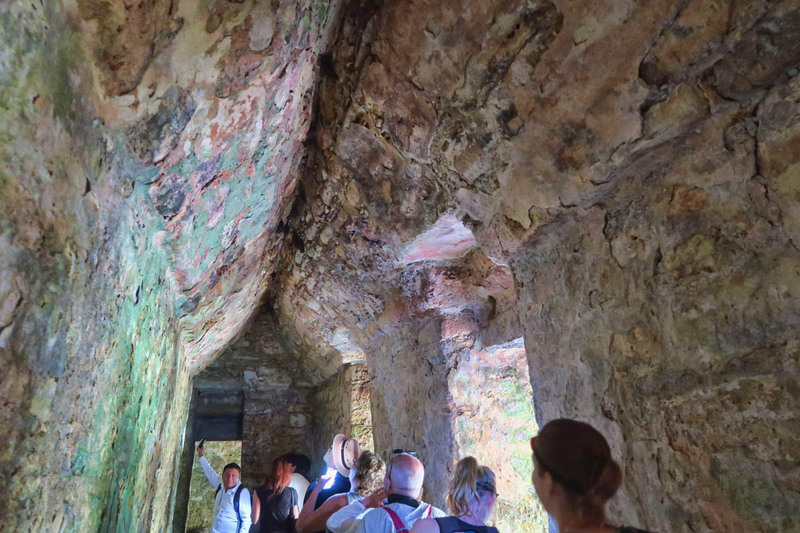 The tour group enters through the labyrinth of passageways and chambers, complete with bats on the ceiling. This is the back side of the entrance-way that opens up onto the complex which was once comprised of 120 buildings. 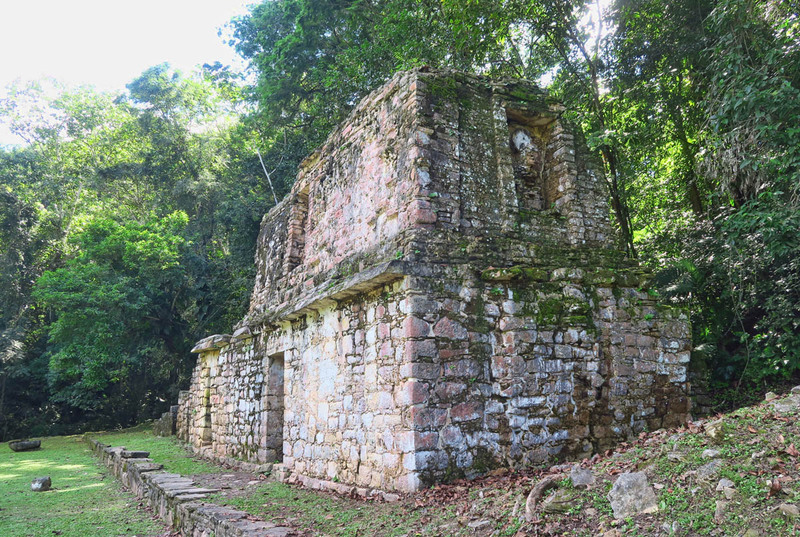 In the center of the massive stairway is one of the carved stelae, while the building at the top of the stairs has an example of decorative roof comb. I marvel at how they built one story structures back then, let alone two or more. 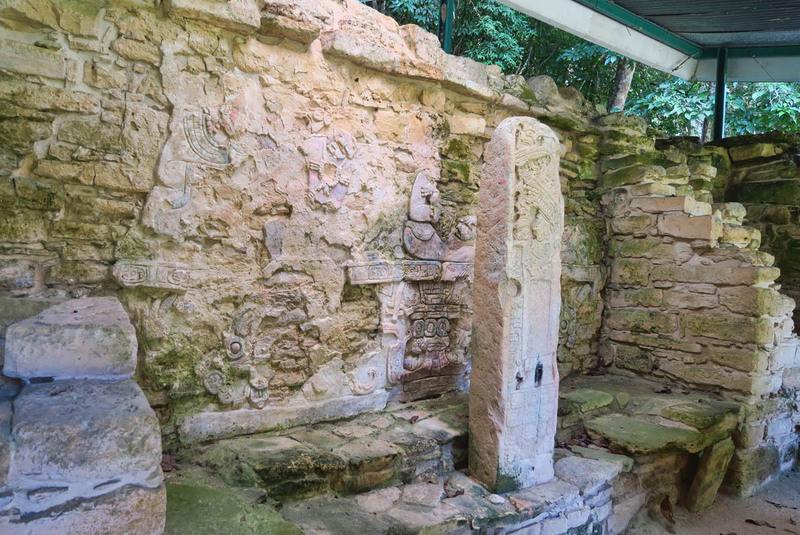 Yaxchilán is best known for its lintels (limestone carvings above doorways) and stelae (upright carved stones) which tell the history of the ancient city and its rulers. 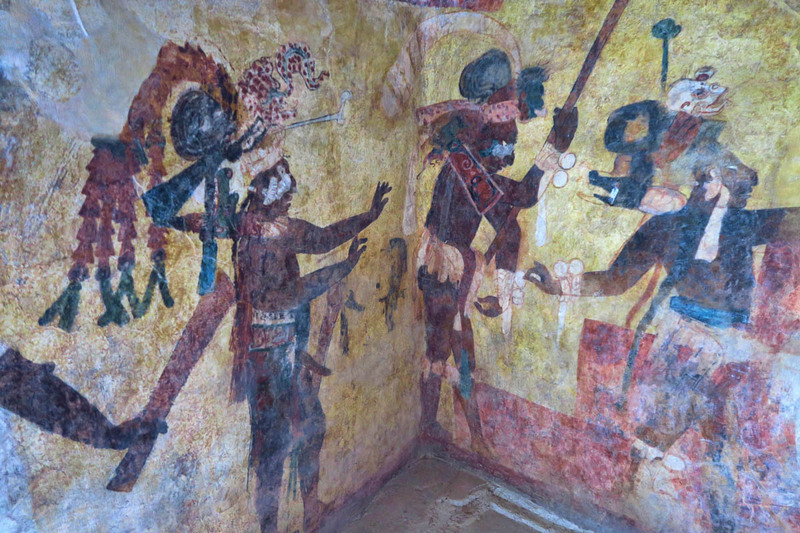 They paint a pretty barbaric picture, with scenes of human sacrifice and blood letting achieved by the royals pulling a thorned rope through their tongue. Our day tour includes a two hour tour through the ruins with a bi-lingual guide, but the gory tales are a bit much in the noonday sun, so I bow out and find a nice shade tree to sit out the second hour. 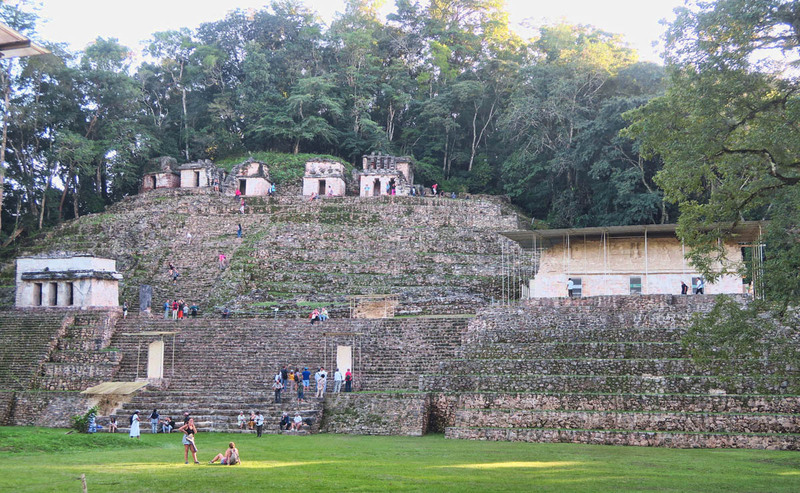 I sit and ponder where on earth they got the motivation to amass enough stones to build 120 terraced structures with towering ornate roof combs, stairways, ramps with no blueprints and rudimentary tools…while in the heat and humidity. 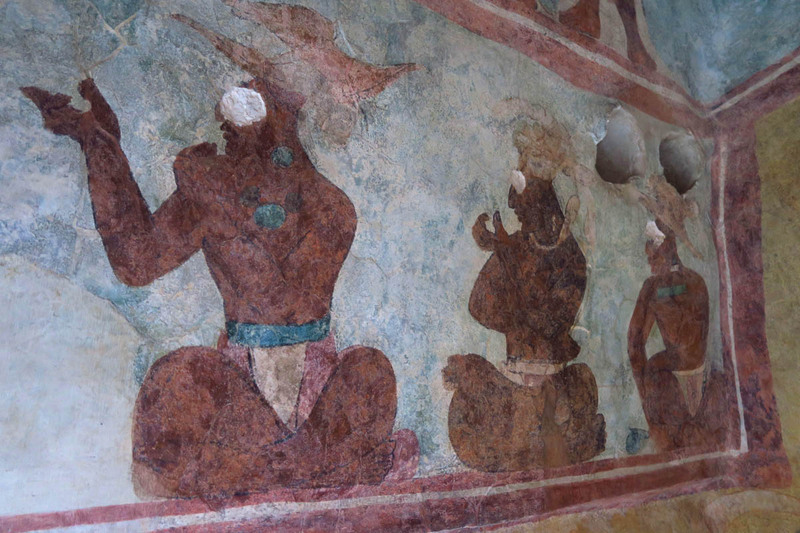 Some of the stucco friezes are still intact. This close-up shows more of the paint colors, all comprised from plants and minerals. Another example of a carved stelae with carvings on the back wall. 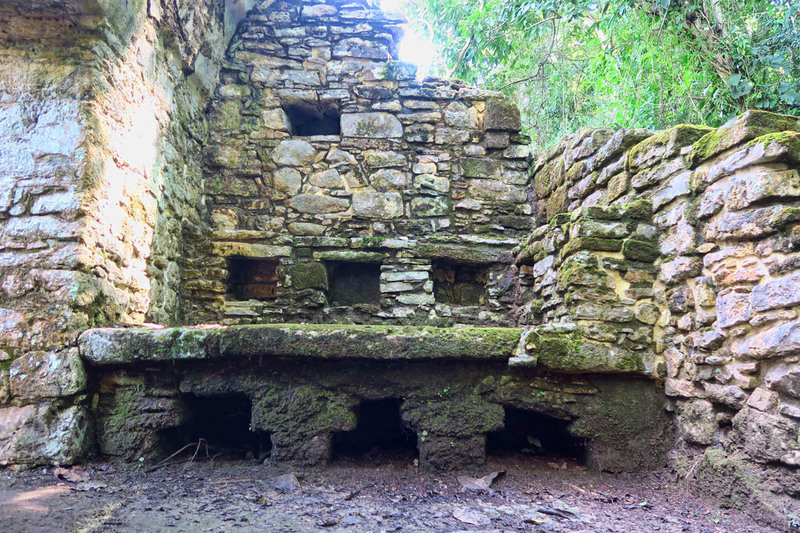 I also ponder the question of whether it was worth riding 3 hours down a bumpy one-lane highway in a bus and 45 minutes down the river to see a yet another Mayan ruin? I might have answered “no” were it not for the second stop on the tour, Bonampok. 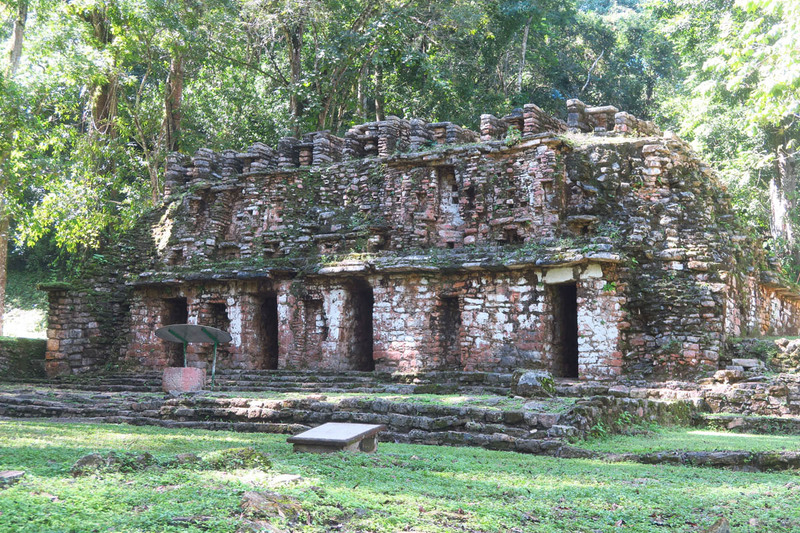 Bonampok is located on the land occupied by the indigenous Lacandon, direct Mayan descendants. 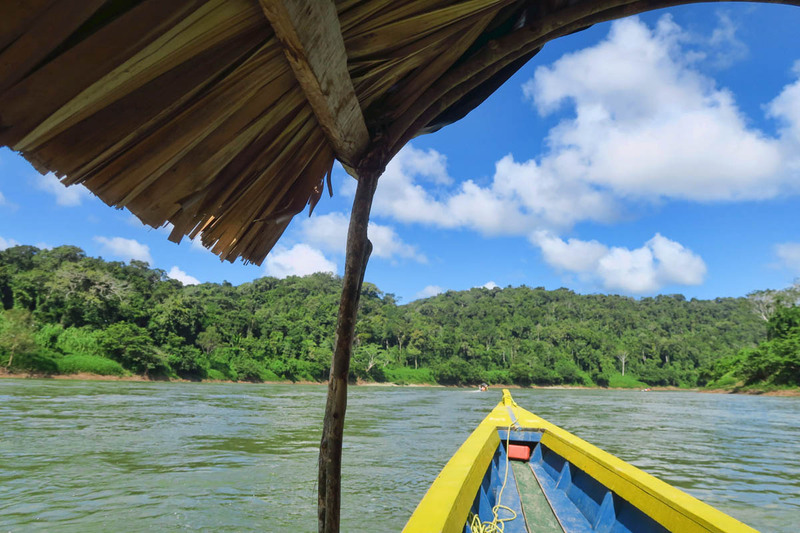 The only transportation into the site is with one of the Lacandon families. So once we reach the front gate, we must disembark our cushy Sprinter van and board a vintage panel van for the last five miles down a washed-out gravel road. 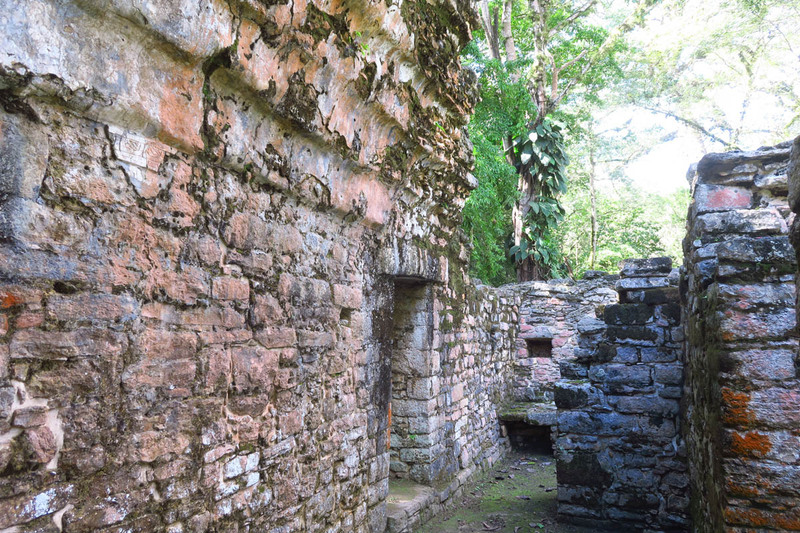 Entering the small “acropolis” of Bonampok, the white 3-doored building on the right houses the Temple of Murals. 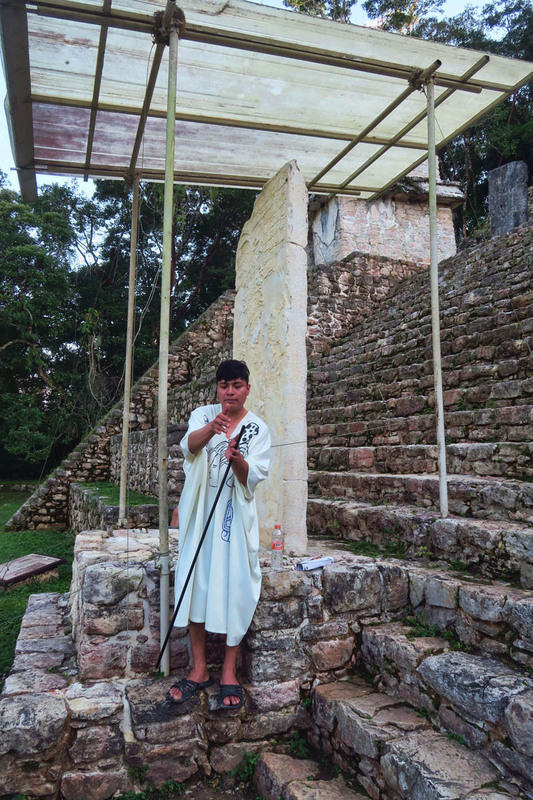 One of the site guides wearing traditional Lacandon clothing in front of one of the giant stelae. 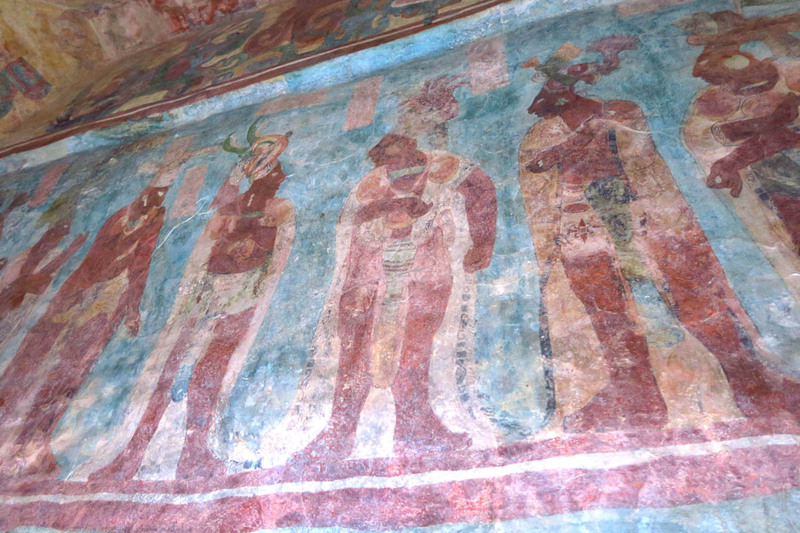 The murals are painted at half-scale, and each one has different clothing, hair, etc. I believe this one was one of the war scenes. It was odd that the eyes were scratched out in every image. I never could find out the exact reason, but theories ranged from them having been inset with stolen gemstones, to being removed for spiritual reasons. 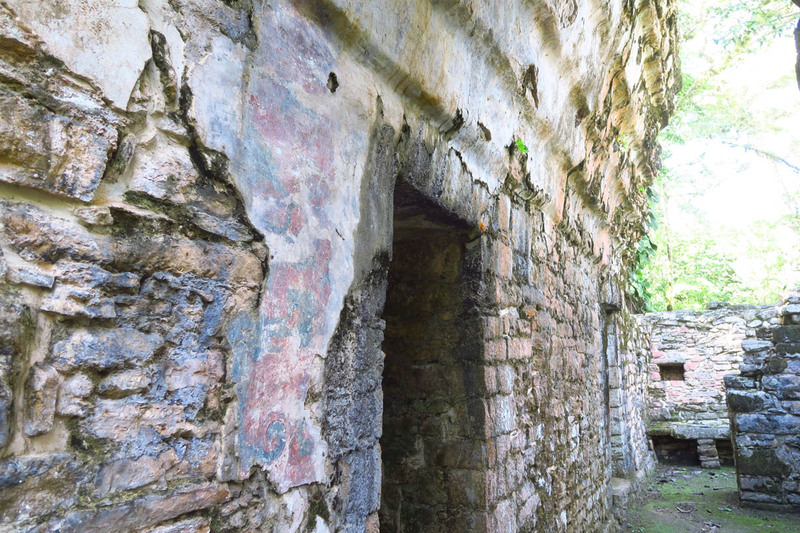 Halfway up the staircase of the main structure, to the right is a small building known as “The Temple of Murals.” The building contains three small rooms, each one telling a different story; the consecration of a ruler, war and conquering of the enemy, and finally, sacrifice and blood letting. 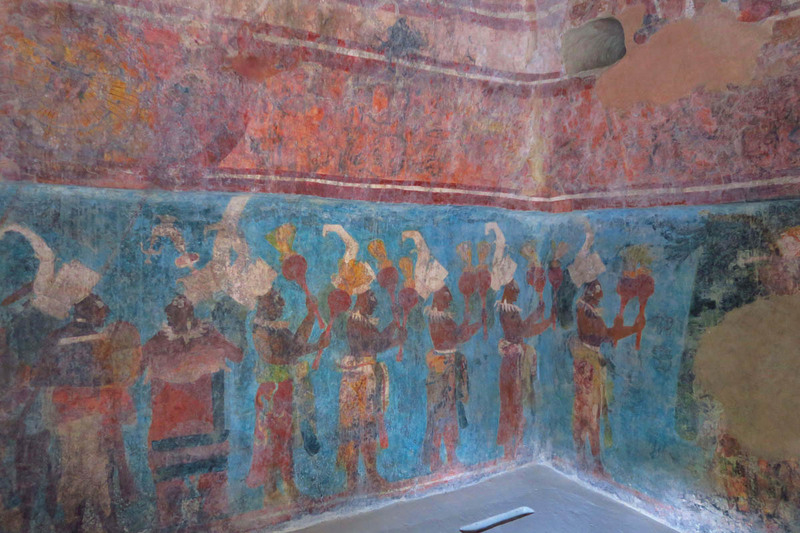 The rooms are about 8’ x 10’, and the frescoes (paint on wet plaster) are painted in half scale. Only three people are allowed in at a time, and all backpacks must be left at the door. Photos are allowed, but flash is prohibited. This is strictly enforced by Lacandon guards at each doorway. 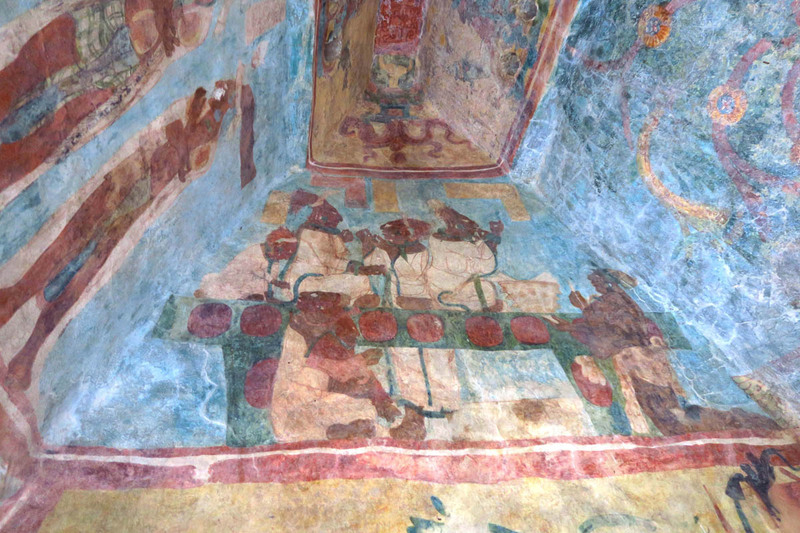 On the upper wall near the angled ceiling is a mural of women in a blood letting ceremony, piercing their tongues with threaded rope. While there are scenes of musical instruments, dancing, and merry-making, there are also images of prisoners with blood dripping from their fingertips. 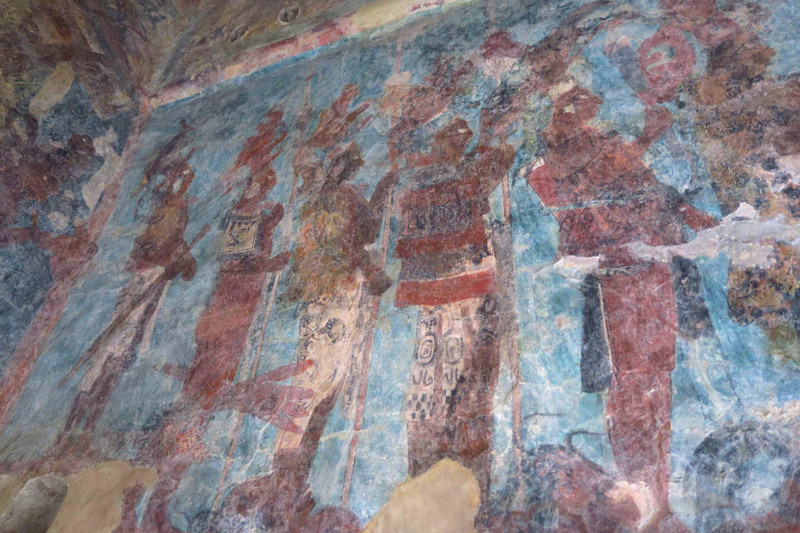 The murals are considered among the finest images of pre-hispanic culture, and important in debunking the romanticized notion that the ancient Maya were peace-loving people. 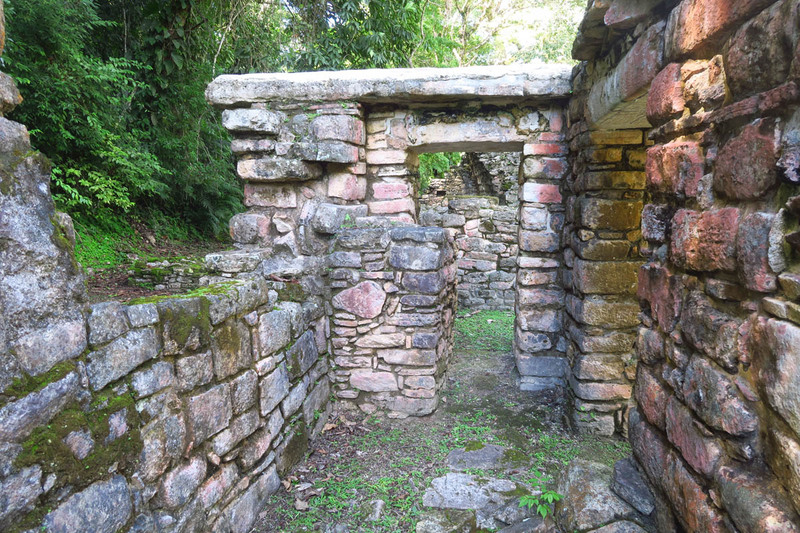 This entry was posted in Mexico and tagged Bonampok, Mayan Archeological Site, Yaxchilan by Suzanne. Bookmark the permalink. Any time TTTH issues a new edition it is eagerly read & always appreciated. Suzanne, It’s so great to hear from you again! I’m happy to embarked on this adventure and grateful that you took the time amidst all you’re trying to do to share it with all of us. You’re posts are always a pleasure to read, past or present. Good to see you back among the “on-line”! What a pain to have to replace all those devices. Our trustily iPhone 4 is still with us, we dread the day that we have to replace it. Keep positive, you are seeing some great sights, we would love to see that area some day. Your donuts are never, ever stale and I never, ever tire of them. I agree with John, Mary, Terri, and Rhonda. Nice to have you back. An Exciting and Rewarding Monday morning for me! My first stop on the internet yielded this new post and rewarding ( as always) narrative from you! In return, heres a tip from me…… yellow legal pads- keep them dry and they last forever! And nobody ever steals them! I spent my working life as an electronics engineer in the computer hardware field and totally share your feelings about what is called technology today. #10 is so frustrating as they keep making software for dummies by dummies and logic has been discarded as each new revision hides my files differently. Bah, humbug! That said, I am happy that you are continuing your wonderful blog on your fascinating travels. It seems that indeed the first settlers of the America’s were human being with the same self destructive tendencies as we moderns. As always we have enjoyed your blog and that alligator looks hungry. So glad you’re back on line!!! So sorry you had to go through this, I look forward to your adventures!!! A good reminder that we need to be more diligent in backing up our computers. 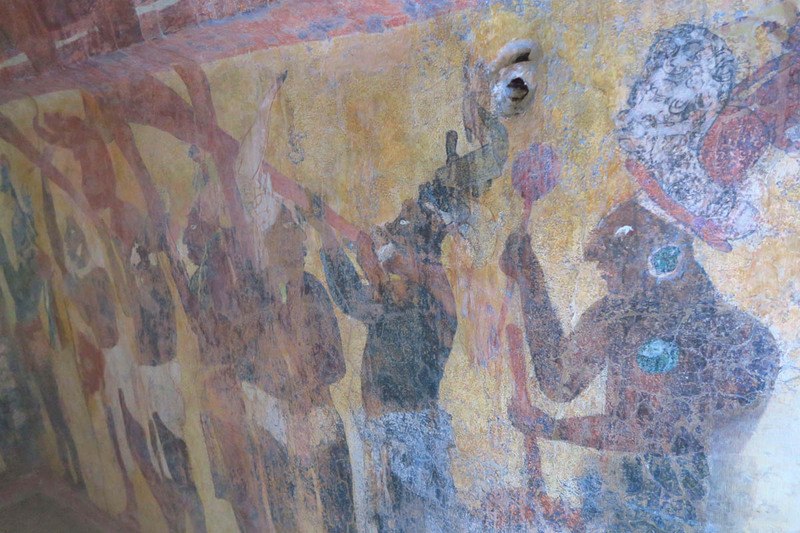 Glad you made that long, unpleasant sounding trip to see the murals so you could show them to us! I have always wanted to go to where you went. I met the grandson of the Great Elder of the Lacondon in 2008 and always hoped to make the trip some day. It is not going to happen, it seems, so I’m thrilled to read your narrative and to see your photos. I have never seen a Lacondon with short hair, nor have I ever seen any with drawings on their muslin clothing. It mus be “new age”. I’ve studied those peoples for about thirty years. Fascinating. Your angst over the loss of your files, photos etc etc etc was my feeling when I was part of that “bit coin” farce when most of my stuff was erased when I would not pay the ransom. Even the “computer guru” could not reconstruct everything other then the things that were on the cloud. A very sad series of events. DO keep posting and writing. I have no idea where you are now, but if you end up back in Mexico, give me a “shout out”. Happy you are back, man 🙂 Looks like you had a wonderful experience at the temples. It is so fascinating to observe these ancient drawings… thank you so much for these fantastic blog posts! 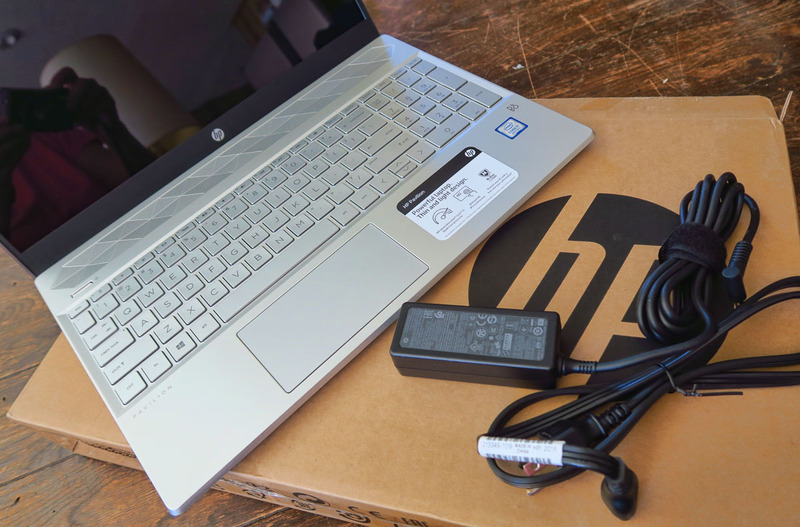 Welcome back to blogging. No matter how much later you post about an adventure I am eager to read it and live just a wee bit through you. I can’t imagine having to rebuild all of my past equipment. Hopefully something special will come of it.